A growing number of governments have made commitments to achieving gender equality and women's rights, with many using gender responsive budgeting (GRB) to allocate resources for the delivery of economic policy and governance that benefit men and women equally. At a time when GRB is growing in global traction, this book investigates what it can deliver for gender equality and state resilience in contexts where the state is weak or prone to violence, such as in Timor-Leste. 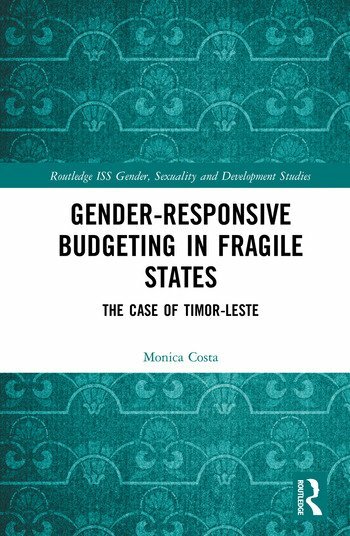 Gender-Responsive Budgeting in Fragile States: The Case of Timor-Leste uses the Timor-Leste case to investigate whether gender equality reform can be adopted at the same time as establishing economic and institutional fundamentals. While some may have thought that the adoption of GRB strategy in 2008 was premature, Monica Costa argues that GRB initiatives have contributed to budget accountability and transparency, and ultimately improved policy and budget processes and decisions. This multi-disciplinary analysis of a decade of GRB demonstrates why GRB is important to inform the debate on state fragility-resilience and argues that fragile states cannot defer gender equality in the name of getting the economic and institutional basics right. While a growing number of fragile states have taken steps to make their budget more gender responsive, questions remain for economists and policy makers about what can be achieved, and how. Gender Responsive Budgeting in Fragile States is the first international publication on GRB in fragile state contexts and will be of interest to researchers, upper level students, policy makers and NGOs with an interest in policy, economics, gender and development. Monica Costa is a former international gender adviser to the government of Timor-Leste and holds a doctorate on gender equality and policy in Timor-Leste from the University of South Australia, Australia.